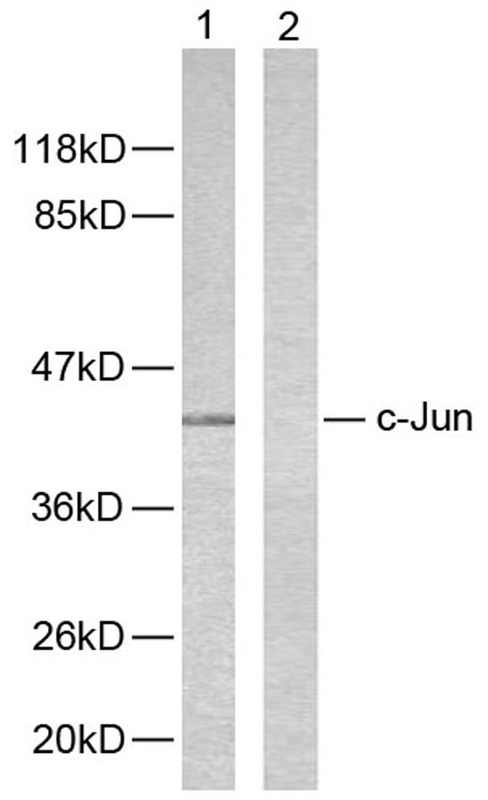 c-Jun (Ab-243) antibody detects endogenous levels of total c-Jun protein. The antiserum was produced against synthesized non-phosphopeptide derived from human c-Jun around the phosphorylation site of serine 243. Small volumes of anti-c-Jun antibody vial(s) may occasionally become entrapped in the seal of the product vial during shipment and storage. If necessary, briefly centrifuge the vial on a tabletop centrifuge to dislodge any liquid in the container`s cap. Certain products may require to ship with dry ice and additional dry ice fee may apply. 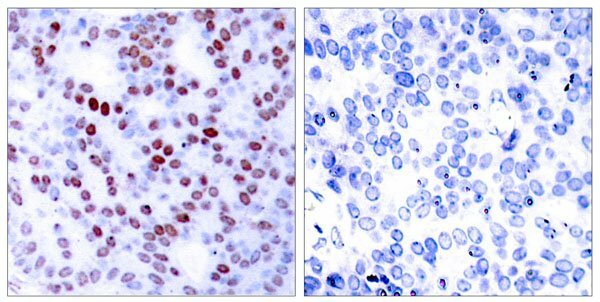 Peptide-+ Immunohistochemical analysis of paraffin-embedded human breast carcinoma tissue using c-Jun (Ab-243) antibody. Western blot analysis of extracts from HeLa cells using c-Jun (Ab-243) antibody. NCBI/Uniprot data below describe general gene information for c-Jun. It may not necessarily be applicable to this product. Boyle W J, et al. (1991) Cell. 64(3): 573-584. Binetruy B, et al. (1991) Nature. 351: 122-127. Smeal T, et al. (1991) Nature. 354:494-496. Derijard B, et al. (1994) Cell. 76:1025-1037. Kyriakis J M, et al. (1994) Nature. 369: 156-160. 1. Results show that VEGFA induces c-jun expression in mediating human retinal microvascular endothelial cell migration, sprouting and tube formation, and that Pyk2-STAT3 signaling enhances cJun expression in the mediation of retinal neovascularization.